If your hardwood floors have been subjected to water from a broken water heater, leaky faucet, or broken pipe, after you call the plumber the next call on your list should be an experienced home restoration professional that uses the Injectidry system. Injectidry. Funky sounding name, right? It looks something like the Willy Wonka version of a machine from “The Matrix.” This colorful, twisting collection of hoses and equipment is the high technology version of water restoration in the San Jose area. The Injectidry system is essentially a high pressure drying system specially designed to efficiently dry high risk areas of hidden moisture. 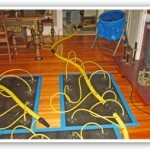 This system for drying hardwood floors was designed as a non-invasive method to save wood floors from permanently cupping and buckling from water damage. 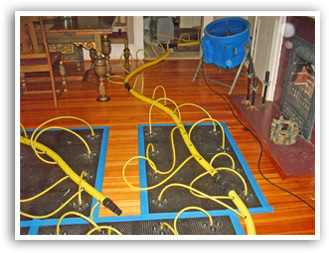 This advanced drying technique utilizes custom specialty rubber panels that cover the water damaged wood floor to create a pressurized environment conducive to moisture removal. Once a seal has been created on the surface of the floor, hoses are connected to a pump and negative pressure is used to pull out the moisture from the wood. The drying time will vary depending on the severity of water damage, temperature and humidity but many of these variables can be controlled with the right equipment and the proper knowledge and experience. Probably the most important factor is how quickly this water restoration process is implemented after the actual water damage has occurred. Many times, permanent damage occurs that could have been prevented with a timely intervention. Interestingly, this system is not only used to dry wood floors, it can be used to dry certain walls and ceilings as well as tile and cement surfaces!